Did you know that every year the North Brisbane Lapidary Club sells raffle tickets to raise funds? Did you know that the tickets are only $1 each? And did you know that all prizes are handmade and valued by a professional valuer? No? For 2019 we have some awesome jewellery – all very different – and all were valued around the $1,000. Yes, that is correct. You can win a piece of unique jewellery for the price of $1. And someone will win it. 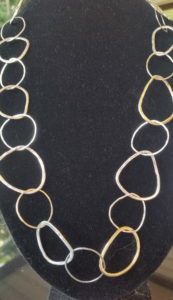 Sterling Silver necklace with freeform links in beaten finish with 1 9ct gold link. Designed & made by K. Hayston. Metal donated by club. 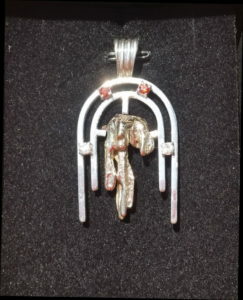 Sterling Silver Pendant with cast 9ct gold central section. Set with white and orange zircons. Designed & made by P. Smith. Metal donated by club. 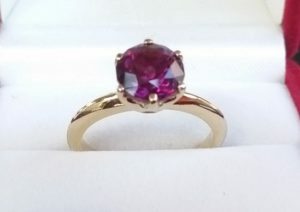 Cast yellow gold ring set with deep purple rhodolite garnet. Stone (2.29 ct, donated by Jim Jeavons. Ring made & donated by Vinh Mould. Well, know that you know the North Brisbane Lapidary Club is doing that, what is your excuse for not going? These are great prizes. I’m hoping to win at least 1!